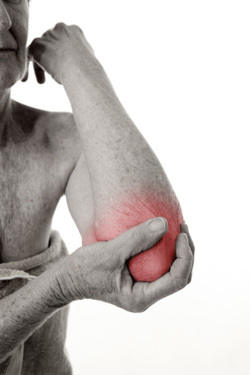 Golfer's elbow – A type of elbow pain that originates near the inside part of the bony protrusion. A tear or rupture in the tendon supporting the elbow bone also causes this type of pain. Locked elbow – A type of pain that occurs when the elbow bones or their surrounding muscle fibers become stiff or immobile from disease or injury. Student's elbow – Another term for bursitis, or swollen sacks under the elbow joint. This is often caused by repeated rubbing of the elbow on a hard surface, such as a desk. Tennis elbow – A layman's term for pain on the lateral, or outside part of the elbow, on or near the bony protrusion. Tennis elbow is caused when the tendon from the elbow bone tears or is ruptured. It's no surprise that professional tennis players can become afflicted by this with all of the stress and strain they place on the joint during play. Carpal tunnel syndrome – Chiefly affecting the wrist, it can cause elbow pain if an inflamed tendon pinches a nerve going to the elbow. Tendonitis – Can cause elbow pain and is caused by an elbow tendon that has become swollen or inflamed when the forearm tendon is damaged.